Required when installing MM K-member. Suitable for others. Extremely wide range of adjustment, much more than allowed by the tapered-stud style. Exclusive MM spacers are stronger than others, will not buckle when the bolt is tightened. Large assortment of spacers allows precise fine-tuning of bumpsteer. Stronger and more rigid than tapered-stud style. Measurement and adjustment of bumpsteer is required during installation. MM's Bumpsteer Gauge is the right tool for that. Copyrighted installation instructions show you how to measure and adjust bumpsteer. 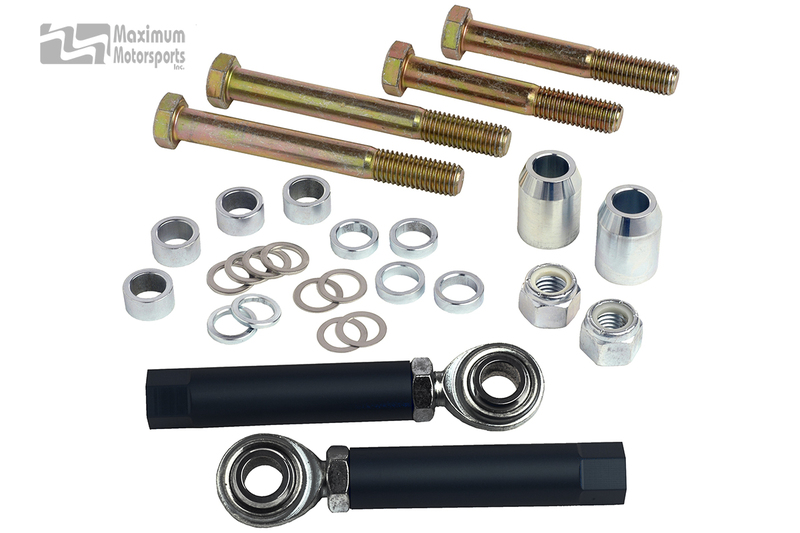 Includes 2 different lengths of 5/8" Grade 8 bolts to ensure the best length for your Mustang. Spacer bushings were designed specifically for this kit. Longer spacer bushings are made of thick-wall Chro-Moly steel to ensure they will not buckle when the 5/8" bolt is properly tightened. A large variety of spacer thicknesses ensure the ability to properly adjust bumpsteer. Hex on the aluminum adapter sleeve is easily accessible because it is at the inner end of the aluminum sleeve, clear of the tire. Requires drilling the spindle steering arm to 5/8". Tapered-stud style (MMTR-4) bumpsteer kit is suitable for stock k-members. 1994-04 Mustang with manual steering rack requires the MMTR-1 bumpsteer kit.